Photograph of newly built Biomuseo biodiversity museum in Panama City, Panama. Photo by: Fernando Aldo, September, 2014. Biomuseo, designed by internationally renowned architect, Frank Gehry, is the first museum in the world dedicated to biodiversity. Opened in October 2014, the museum is located at the end of the Amador Causeway in Panama City, facing the Pacific Ocean at the entrance of the Panama Canal. George Angehr, the Curator of Exhibits at Biomuseo and an ornithologist from the Smithsonian Tropical Research Institute, played an integral role in developing the scientific content found in the eight exhibitions in the museum. He said Panama’s unique position made it the natural choice for the world’s first biodiversity museum. Exhibitions currently include the Human Path, Worlds Collide, Building the Bridge, the Living Web, and the Biodiversity Park. Angehr, who was involved in all of them, said his personal favorite was Worlds Collide. In a 2015 interview with mongabay.com, Angehr talked about what visitors can expect when visiting Biomuseo and how the new museum could raise biodiversity awareness and further conservation efforts in Panama and beyond. George Angehr: I am an ornithologist by training, and have conducted bird research in Panama, Peru, Gabon, New Zealand, and other places. However, I also have a background in art, having worked as a botanical illustrator. I have also worked on museum exhibitions for more than 27 years with the Smithsonian Institution and other organizations. I’m originally from the Bronx in New York City, but have lived in Panama for more than 25 years. 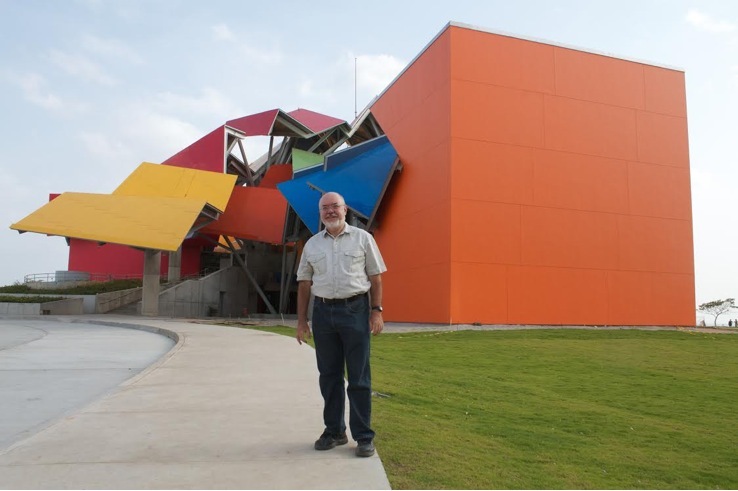 Photograph of George Angehr outside of Biomuseo in Panama City, Panama. Photo by: Brian Gratwicke. Mongabay: Will you explain the history and concept behind Biomuseo, and its reason for focusing on biodiversity? 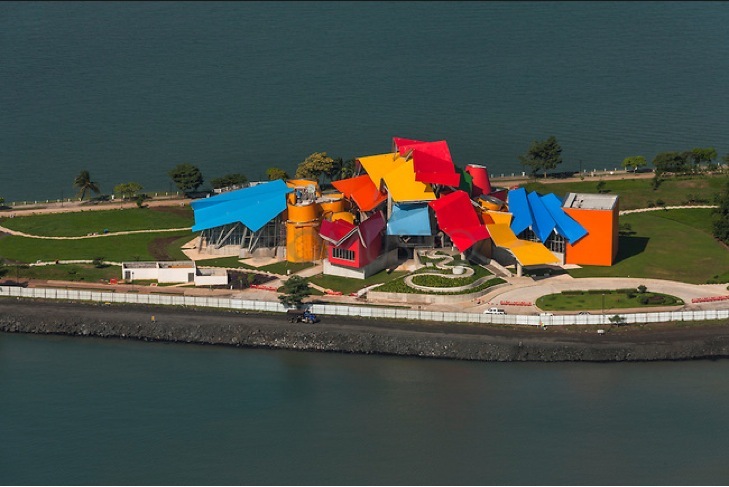 George Angehr: The Biomuseo originated conceptually in 1999, when architect Frank Gehry designed three “Gateway Projects” to promote a tourism plan for Panama. One of them, at Amador, eventually became what is now the Biomuseo. Gehry wanted the museum to not be just important for its architecture, but also for its content and cultural significance for Panama. Because of this, he brought in the designer Bruce Mau to develop the exhibition strategies, and the Smithsonian Tropical Research Institute to develop the scientific content. Mongabay: Why was Panama chosen for the site of the museum? George Angehr: Panama, mostly formed by volcanism, is one of the youngest bits of land on the planet. When it was finally completed between three and four million years ago, it changed the world in innumerable ways. It united the continents and divided the seas, triggering climate changes throughout the world. We use Panama as a metaphor for global connectivity, to show how small things can have big effects due to the connections they make and the connections they break. This complex history has helped produce Panama’s great biodiversity. As a bridge between continents, its flora and fauna combines elements from both North and South America. As a barrier between oceans, its coasts feature dramatically different communities on the Pacific and Atlantic sides. Panama is also an evolutionary experiment on a grand scale, showing how species have diverged on either side of the isthmus since they were separated a few million years ago. Mongabay: What can visitors expect when they visit Biomuseo? George Angehr: The Biomuseo is very different than a traditional natural history museum. The architecture, exhibit design, and scientific content have been integrated into one synthetic whole to a greater extent than in any other project worldwide. For example, each gallery features an element dubbed by designer Bruce Mau a “Device of Wonder,” a large element on the boundary between art and science used to convey the key scientific concept of the gallery, and to draw the visitor in rather than to push information at them. Currently five of the eight permanent exhibit galleries are open: The Gallery of Biodiversity, explaining what biodiversity is all about, why we need it, and what is happening to it today; Panamarama, an immersive audiovisual presentation providing an introduction to Panama’s natural environments; Building the Bridge, which explains how the isthmus was created through processes of volcanism and sedimentation; Worlds Collide, about the Great Biotic Interchange, the vast migration of plants and animals between North and South America that started once the land bridge was completed between 3 and 4 million years ago; and The Human Path, the story of humans in the isthmus since their first arrival up until to the present. The remaining three galleries, Oceans Divided, The Living Web, and Panama is the Museum, are occupied by temporary exhibits pending funding for installation of the permanent ones. Mongabay: What galleries and exhibits were you personally involved with planning and developing at Biomuseo, and which ones do you consider your favorite and the most impactful? George Angehr: As Curator of Exhibits, I have been involved in every aspect of exhibit planning and concept development for all eight galleries since the beginning. I wrote the original concept document for the scientific content of the museum in 2000, and since then have worked closely with the designers to devise ways to illustrate these ideas in an engaging way. I wrote the exhibit scripts for all the galleries, and defined and helped select all the specimens (some of which I collected), models, photos, illustrations, interactives, and other elements on display. My personal favorite is Worlds Collide, which depicts the great migration of animals between North and South America with a stampede of 97 life-size sculptures of animals up to the size of mastodons and giant ground sloths. I designed the original model for the sculpture, which has been brilliantly realized by Blue Rhino, an exhibition company based in Minnesota. Mongabay: What roles will the Smithsonian Tropical Research Institute and the University of Panama have in developing projects and leading exhibits at Biomuseo? George Angehr: The Smithsonian Tropical Research Institute and the University of Panama were closely involved in the initial development of the exhibits. In particular, most of the scientific content in the Biomuseo is based on research carried out at STRI. Mongabay: Will there be galleries that explain the geological development of the Panamanian isthmus as well as ones that explore the ecological biodiversity of Panama? George Angehr: Building the Bridge presents the geological history of Panama. The forthcoming Living Web gallery will describe all the complex biological interactions in a tropical rainforest, including competition, predation, parasitism, and mutualism. The central element in this gallery will be an abstract sculpture of a strangler fig tree, showing all the plants and animals that live in the tree and their interactions with one another. 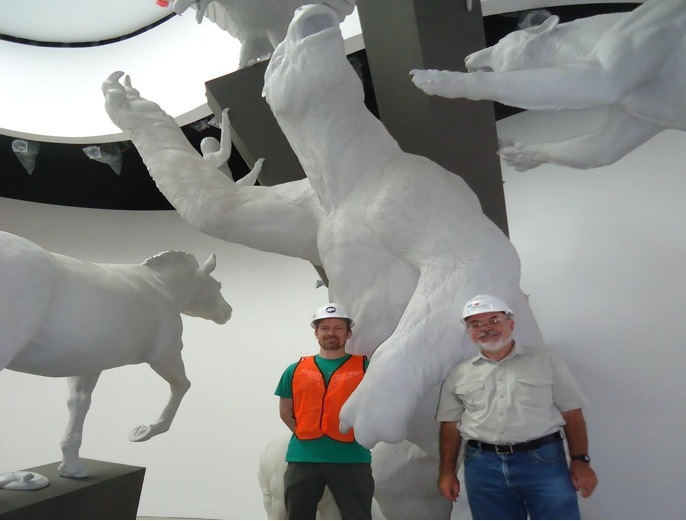 Photograph of George Angehr (right) and Jim Burt (left), lead sculptor of the animal figures, at the installation phase of the Worlds Collide Sculpture exhibit at Biomuseo. Credit: George Angehr. 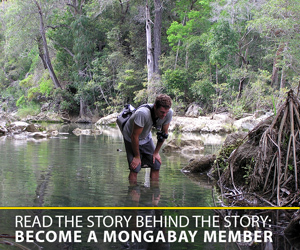 Mongabay: Will you tell us about the Human Path exhibit at Biomuseo? George Angehr: The Human Path contains 16 colorful illuminated columns describing how humans interacted with the Panamanian environment in four time periods: the first Paleoindian big game hunters who arrived as much as 15,000 years ago, and the early development of agriculture; the more complex agricultural societies that developed later, with their spectacular pottery and gold work; the colonial period, which produced a new mixture of cultures; and the 20th Century and the present, including the building of the Panama Canal. Mongabay: What is the importance of the Biodiversity Park located on the grounds of Biomuseo? How were the plants chosen for the park? George Angehr: The Biodiversity Park, which has not yet been installed pending funding, will feature exhibits related to those within the museum, such as plant biodiversity; plants that came from north and south; biological interactions such as butterfly and hummingbird pollination, etc. The plants were chosen by landscape designer Edwina von Gal in conjunction with scientists. Mongabay: What social effect do you expect Biomuseo to have on visitors in regards to generating biodiversity awareness and environmental conservation in Panama? George Angehr: We hope the Biomuseo will have a transformative effect in making Panamanians aware of their great biodiversity of their country and its global significance, and stimulating greater involvement in conserving that biodiversity. Mongabay: Are there plans to establish any other biodiversity museums similar to Biomuseo anywhere else in Panama or the rest of the world? George Angehr: Not that I am aware of. (03/03/2015) Anyone who has ever felt the sting of shame, knows its power. Shame has long been used by societal institutions—families, communities, governments, religions—for making individuals tow the line of the majority. But a new book explores another—arguably more positive—side of shame: its potential to challenge rule-breaking and ethically-defunct corporations. (01/16/2015) The bulk of life in the rainforest is found the leafy layers of the canopy. But little was known about this world until relatively recently, when hobbyists, naturalists, and researchers began devising ways to access the upper levels of the forest. These efforts accelerated in the 1970s when scientists started to use mountaineering techniques and ropes to climb towering rainforest trees for long-term study and observation. (01/15/2015) While conducting doctoral research on tamarin reproductive biology in the Peruvian Amazon, Mrinalini Watsa realized she needed help in the field. Rather than hiring seasonal assistance she, along with Gideon Erkenswick, decided to create a life-changing non-profit organization, PrimatesPeru. The new NGO would allow students to conduct field research in one of the most biodiverse, yet threatened, places on Earth.